NORTHBROOK, IL—Describing them as the perfect seating options for abandoning to the elements, Crate & Barrel on Monday unveiled a new line of disgusting couches made specifically to be put on your porch. 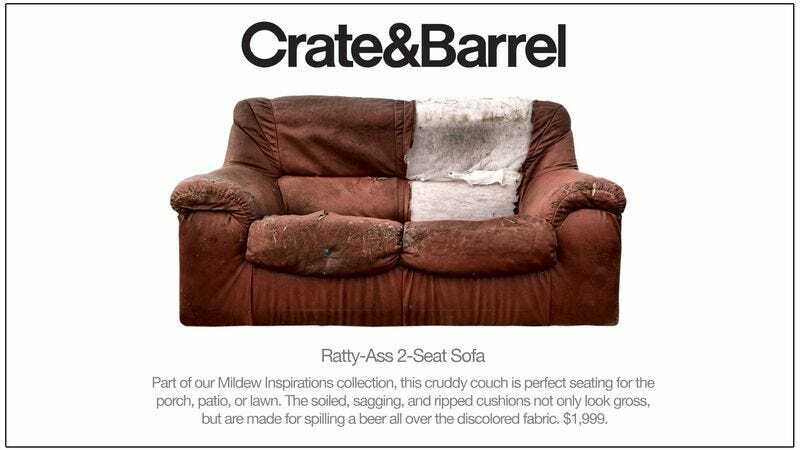 “Each ratty couch in our Mildew Inspirations collection is carefully designed to be left outside, rained on, and dragged into the yard during a party,” said Crate & Barrel CEO Neela Montgomery, adding that every dilapidated style in the collection would be available in tattered vinyl or heavily pilled polyfiber and that customers could choose from a variety of colors including yellowing green and faded black, as well as 10 varieties of brown. “These couches have been impeccably assembled to deeply sag in the middle and reek of beer, with meticulous attention paid to making sure each couch is covered in sauce stains and wobbles no matter where you sit on it. Additionally, customers can have their couches customized with strips of duct tape over the gashes in the fabric or a thick layer of dog hair covering each cushion.” Montgomery went on to say that the couches come with a set of two rust-colored throw pillows that are always damp and release a sour puff of air from their ruptured seams every time they are handled.